Bacteria breaching gum line can reach your heart by circulation. This diagram was modified from slide by John C. Comisi, DMD. Lifestyle hygiene is as important as impeccable oral hygiene for Whole Health. That means no smoking, exercise, eating right, and reducing stress. Avoid sugar and refined carbs, and get a good night sleep to give your immune system the best shot at the bad bacteria. Do your gums bleed when you brush, floss? Think it does not matter? It does to your heart. See more from Your Heart and Your Mouth. Busy people just don’t have all day to fuss over brushing and flossing. That’s why 90% of Americans ages 55 – 64 have periodontal disease, and two out of three Americans ages 35 – 44 have periodontal disease (1). Peri- means around, -odontal means teeth. Periodontal disease is the biggest reason of teeth falling out. Along the way, the whole body suffers its contribution to inflammation and atherosclerosis. Biofilm is the threat from mouth to heart. Biofilm is a beehive of bacteria that starts out with film of saliva and resident oral bacteria attached to teeth surface below gum line. Under stress, dehydration, bad diet, and inadequate oral hygiene, bad bacteria can multiply and start a fire of inflammation under your gums. 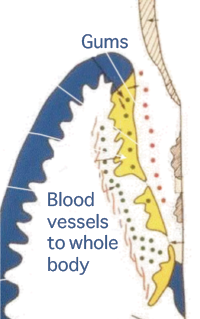 When inflammation breaches the thin line separating the mouth and the body’s vascular tree, bleeding points become pumping stations for spreading periodontal infection all over the body. PerioProtect is a FDA approved medical device made by certified dentists to treat periodontal disease at home with in-office care. Custom-fitted PerioTrays have a seal that drives peroxide and other anti-bacterials under the gums to breakup biofilms. 99.97% of pathogens are gone in 17 days (2). PerioProtect breaks up biofilm left behind by brushing and flossing is not effective. Patients report less bleeding and easier dental cleanings, fresher breath, and feeling better with more energy after wearing a trays 2-3 times for 15 minutes each. “Side effects” include whiter teeth and fewer cavities. Prevention is the key to controlling gum disease and heart disease. The battle line is under the gums. 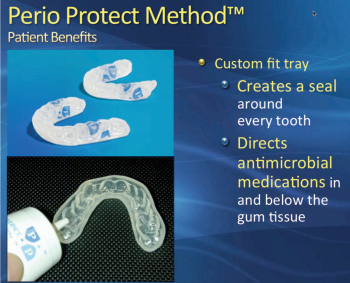 PerioProtect is a simple and proven home care method to improve gum health and reduce inflammation for everyone.